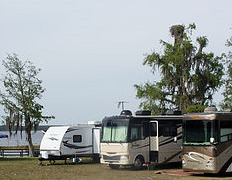 Lake Hatchineha Resort and RV Park is located on Lake Hatchineha in Haines City, Florida with a private boat ramp. Lake Hatchineha, a 6665-acre expanse in Osceola County, welcomes both tourists and residents to its beautiful Central Florida shores. Lake Hatchineha Resort and RV Park is located on Lake Hatchineha in Haines City, Florida with a private boat ramp. Lake Hatchineha, a 6665-acre expanse in Osceola County, welcomes both tourists and residents to its beautiful Central Florida shores. Lake Hatchineha is part of a chain of lakes known as the Kissimmee Waterway. Boaters can travel the 56-mile long waterway connecting Lake Tohopekaliga to the north to Lake Okeechobee to the south, passing through Lake Hatchineha and along the Kissimmee River through a series of canals and man-made locks. Lakes in the Waterway’s upper basin are fairly shallow with average depths ranging from 6 to 13 feet. The Kissimmee Waterway is known for some of the best fishing and hunting in Florida. You can catch daily limits of Bass, Catfish, Crappie (Specs), and Shell Cracker; and then hunt for Whitetail Deer, Hogs, Turkey and of course Alligator and Frogs. Centrally located and convenient to Busch Gardens, Disney, Lego Land and Sea World all within 45 minutes to 1 hour. Or just relax to the amazing sunrises and sunsets. All this is available just steps from your front door.